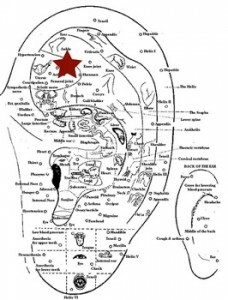 This entry was posted in Acupressure YOU can do and tagged anxiety, calming, depression, emotional pain, mental health, relaxation, soothing, stress by Sharon Rose. Bookmark the permalink. Hi you have a nice blog! I wanna say thanks for sharing these cool posts with us. Keep up the great job. Thanks for asking! I would not recommend that. As I mention in my article on piercings, metal blocks energy and could make the problem worse. Using glass, bone, or plastic would be better, but you still have to disrupt the point to put the earring in… the process of piercing itself is damaging. Instead, I would recommend massaging your ear. If you want to swing by the office, I’m happy to give you some ear seeds for acupressure (radish seeds on tape) at no charge. I would also recommend practicing some conscious relaxation. Breathing exercises, brief meditation, exercise, and re-routing your thinking to more positive messages can all help. Find something that relaxes you – it doesn’t matter what it is – singing, playing a silly game on your phone, knitting, thinking about a project or happy memory – and use it to derail that anxiety train. Good luck!